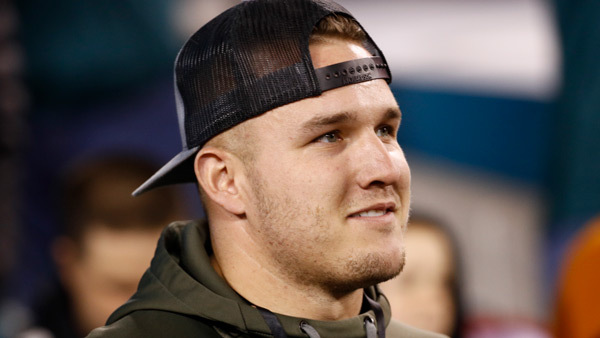 Mike Trout, the best player in baseball and a devout Philadelphia sports fan, revealed the depth of his love for the Eagles on Sunday when he wore a dog mask to the team's 38-7 victory over the Minnesota Vikings in the NFC Championship Game at Lincoln Financial Field. Now the mask has come off -- and the gloves along with it. Trout has yet to decide if he will attend Super Bowl LII on Feb. 4 in Minneapolis or watch it on television. But when the game is over, he expects the Eagles to be celebrating a victory over the favored New England Patriots. Over the past two years, Trout has developed a close friendship with Eagles quarterback Carson Wentz. The star athletes bonded over a hunting trip in December 2016, and Wentz and Eagles tight end Zach Ertz have since been spotted giving Trout souvenir footballs in the stands after touchdowns. Trout's passion for the Eagles prompted media members throughout the country to call the Angels in search of interviews this week. The team's media relations department arranged a conference call Tuesday, and about 50 reporters called in and spoke to Trout for more than 20 minutes. Trout, an Eagles season-ticket holder, said he received the dog mask that he wore Sunday from offensive tackle Lane Johnson.He attended the game with Angels pitcher Tyler Skaags, a longtime Vikings fan. In recent years, Trout has defended Philadelphia sports fans when they've been characterized nationally as over-the-top. He engaged in a good-natured back-and-forth last spring with New Jersey governor Chris Christie, a Dallas Cowboys fan. Mike Trout feels sorry for Chris Christie being a Cowboys fan. While Philadelphians can take heart in Trout's endorsement of the Eagles, he declined to make the declaration that the city's sports fans most want to hear. He's owed $99.75 million over the three years left on his contract with the Angels, and he dismissed the notion that his support of Philadelphia sports reflects a desire to return East and play for the Phillies one day.